The city of London, the Old Smoke, once upon a time called Londinium by the Romans before being abandoned in the fifth century, is the city name which I heard more times than all the other cities combined, from the early days of childhood. All that time, London had the image of something special, a place so huge beyond common man’s reach, a wonderful place of beauty, modernisation, art and literature which combined at such a way that it is far superior to anything. It was that time at early school when the known big cities to me outside were London, New York, Washington, Paris and Rome. But a long time has passed since then and priorities changed; most of the favourite cities of mine were shifted to Spain, Italy and Greece by a mind which had undergone transformation. But still, London stayed there at a high position with Canterbury, as they were quite close to each other and there was the need for London in that study of British Literature and it’s long history. Situated on the banks of the largest river flowing completely through England, London with the Thames river had to be part of the journey. From ‘Three Men in a Boat’ by Jerome K. Jerome to ‘On Westminster Bridge’ by William Wordsworth, with mention in T. S. Eliot’s ‘The Wasteland’, along with it’s presence in ‘Our Mutual Friend’, ‘Sherlock Holmes’ stories and ‘Oliver Twist’, the river and it’s precious city continues to live another life in books. The River Thames is the waterbody we knew the most; it is not like I recognized it from the moment I first saw it, but it had it’s moments in the literature and the movies along with the city of London. The river adds beauty to the London Eye or the Millennium Wheel, the tallest Ferris wheel in Europe, and the most popular paid tourist attraction in the whole United Kingdom. It was the tallest operating Ferris wheel until being outdone by the Chinese Star of Nanchang and the Singapore Flyer. It is the successor to the Great Wheel which used to stand on the banks of the river before the Eye was constructed. The Tower Bridge which crosses the river and leads to the Tower of London is a wonderful scene, especially in the night; it makes everything else pale in comparison and makes one stand there and take photos from so many angles forgetting that there is a river to fall into and drown. For me, it looked like a Gothic church tower from a distance; if there is a real historic bridge, this is the one; people can make bloody imitations with cash, but this Tower Bridge is the one real bridge which is an architectural beauty beyond all comparisons. People can go on building the largest, tallest and longest bridges of the world with money power, but this bridge is the superior one. On the north bank of Thames, lies the Palace of Westminster, another beautiful structure which looks even better when combined with the River Thames for a picture. It’s Clock Tower, the Big Ben stands tall separating time zones. Currently, the largest four-faced chiming clock and the third tallest free-standing clock tower in the world, the symbol of both London and England, and always my favourite clock not to be overtaken by any imitations around the world. For me, any imitation would be just as cheap as the small Big Ben model which I have bought and kept in my book shelf. The Tower of London, the historic castle on the north bank of the River Thames also deserved a souvenior, but I had to adjust with that Big Ben for then. 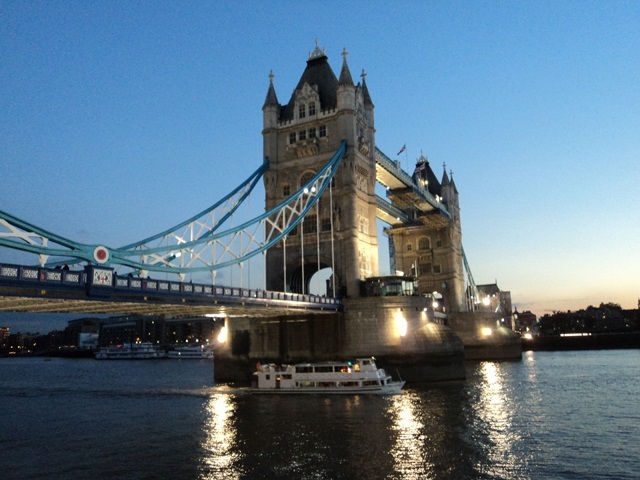 Supposed to be built by William the Conquerer, the last person to conquer the island from outside, most of it constructed during the years of Norman Conquest of England and what followed, it combines with the Tower Bridge to give that fantastic historic look to the city of London. Just like they said in the movie ‘Night at the Museum’ and what happened to me during a long train journey with tea and history books, there history came alive again; with no support from books or thoughts, but directly in front of my own eyes; might have inspired a book if there was enough time to be spent on that side of the river Thames. The largest Catholic church in England and Wales, the Westminster Cathedral in London is the mother church of the Catholic community in England and Wales and the Metropolitan Church and Cathedral of the Archbishop of Westminster and is dedicated to the Most Precious Blood of Jesus Christ. It is of Neo-Byzantine architecture and it reminded me of Hagia Sofia or the Church of Holy Wisdom of God of Turkey which I have seen in a thousand photos. But Westminster Abbey was always going to be the high priority place considering the presence of the Poets’ Corner. From Geoffrey Chaucer, the first person to be buried there, it had most of my favourite poets including Alfred Lord Tennyson, Edmund Spenser, Robert Browning, John Dryden and the others for whom there were memorials and the rest who are going to be my favourite poets as long as I read their works in the future. It is still mainly a Gothic church located just to the west of the Palace of Westminster quite close to the parliament. It is the traditional place of coronation and burial site for the monarchs of the Commonwealth realms. Since the coronations in 1066 of both King Harold and William of Normandy or William the Conqueror, coronations of English and British monarchs were held in the Abbey by the Archbishop of Canterbury. Since 1100, there have been at about sixteen royal weddings at Westminster Abbey, the last one in this year itself, that of Prince William, Duke of Cambridge and the grandson of Elizabeth II to Catherine Middleton. St Paul’s Cathedral sits at the top of Ludgate Hill, the highest point in the City of London, and is the seat of the Bishop of London. It used to be the tallest building in London and is the largest church building in the United Kingdom after the Liverpool cathedral. The current cathedral is an architectural marvel, built after the Great Fire of London of 1666 which destroyed most of the church building. The construction has gone through various stages of difficulty, as it was a clear challenge considering the weight of the huge dome which challenged a number of big domed church structures of the christian world. For the first time, there were three layers of domes instead of the one big dome on the top, and the middle structure is less curved and is hidden, but built to hold the weight of the huge dome. The big dome inspired by St. Peter’s Basillica in Rome, forms a thing of beauty in the skyline of London. It has stood it ground as a powerful creation, surviving the strategic bombing of Britain by Nazi Germany mostly due to the right intervention of the Royal Engineers and also by luck. The cathedral has a number of statues, carvings, tombs and memorials and with it’s huge pillars and clock towers, remains one of the best examples of the English architecture of the 17th and 18th centuries. It always reminded me of John Donne, the metaphysical poet who served as the dean of St. Paul’s for ten years till his death in 1631. Buckingham Palace, the primary residence of the British monarch and 30 St Mary Axe are the two buildings which I wanted to have a closer look, but I couldn’t. Missing Madame Tussauds was a big dissappointment, but not as much as missing the Lord’s cricket ground, the Wembley Stadium and the All England Lawn Tennis Club or the home of Wimbledon. Missing the home grounds of Chelsea and Arsenal was considered an extreme act of cruelity towards to wonderful football clubs by some supporters of these clubs and I am extremely glad that they didn’t start a strike in front of my place. There were also a few skyscrapers to be noticed, but the distant view was to be considered satisfactory due to the lack of time. All these proves that London was not to be left for the last day or even week; there is always more to London than it meets the eye and to find them all, there is the need for many days and even weeks. But it was Leeds which took London’s place being the most visited city and Celtic Football Club being the most time-spent club. Still, this is not the end; London will come alive before my eyes another day and at that time, it would be a day of exploration in those black cabs of London as well as those double decker buses with open top. There would be London as a whole, and myself at the centre. Manchester is the city, I always knew about; it is the English city name which I heard the second most after London, and most of the time it was related to sports. It also had a wonderful Gothic cathedral dedicated to St. Mary, tallest all-steel residential building in the United Kingdom called No. 1 Deansgate, a great tram system, the tallest skyscraper outside London known as Beetham Tower as well as a bigger structure which is being built. We had the opportunity to travel from Cochin to Dubai and then to Manchester thus starting the journey from this historic city. But the procedure of wandering around Manchester didn’t happen on the same day, as it happened later in a few days. Manchester always was a top priority not considering the historic landmarks; as they would be Canterbury, York and London the other way. But considering Manchester as a city, being there was needed; not only for myself, but for some of my friends who are heavy supporters of the most successful club in English football Manchester United; I don’t really have many Manchester City fans as friends, or there is not any to boast about, but that club also had to be in the list to visit, along with the cricket ground there. The journey had to start at Old Trafford, the home ground of the most popular soccer team in the world, and without any doubt, the most successful. I rarely followed the English Premier League as my interest was more into the national teams when there was the World Cup, Euro or Copa America, but I always knew the team which has won the most titles in English football. The first thing that comes to mind when thinking about them is that bar scene in the movie Euro Trip and what followed, and also my friends, the Manchester United supporters who makes fun of Chelsea, Manchester City, Arsenal and Liverpool most of the time. Dhan Dhana Dhan Goal was also something which brought the team into my mind, but from that moment at Manchester, none of them were needed to remember the club. Theatre of Dreams, the second largest soccer stadium in all England, with wonderful looks and the proximity to the cricket stadium. But finding the cricket stadium was going to be a difficult task as not many knew much about it. There existed not much clues about where to go; it was not going to be like finding the home of the Red Devils, it was like finding El Dorado, Atlantis, the Holy Grail, the Fountain of Youth or the Golden Fleece; but somehow it was found in the end. 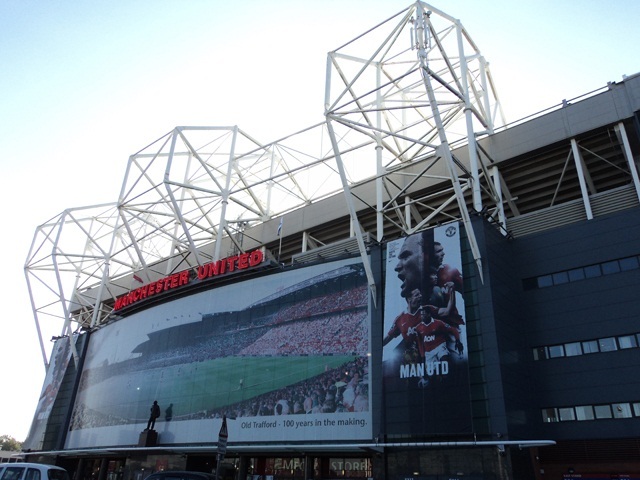 I would dedicate my visit to one Old Trafford related to soccer to so many people, my friends who want to be called mancunians than anything else, but who would I dedicate my journey to the other Old Trafford to? I wonder if anybody would want that to be in their name. While the soccer stadium had so many visitors, the cricket stadium was deserted and people seemed unaware of it. Even the security personnel there seemed quite happy that we wanted to see the cricket stadium and not the soccer extravaganza on the other side. I felt that it was so unbelievable for him, but the fact that we were Indians would have cleared his doubts about us being at the wrong stadium. It was good to be at that stadium, as it was good looking and so well maintained. I did wonder how they managed to maintain it so well considering the very low number of visitors and cricket seeming to be of very less importance out there. If there was such a stadium instead of Jawaharlal Nehru stadium at Kaloor, Cochin, people would have been crowding to come in and have a look around it. Everything about it looked so perfect, with a modern and historic touch added to it without losing it’s sporting essence. But I do wonder what role would cricket have, with soccer already risen above the limits and tennis always there as the new game for gentlemen. The chances for the former gentleman’s game is surely bleak at that part of the world. Manchester City, the other soccer club of Manchester had a stylish looking stadium and as a club which is rising by a big margin these days, was worth a visit too, even as it wasn’t really listed in the first schedule of journey. The fifth largest stadium in the English Premier League and the twelfth-largest in the whole United Kingdom, has kind of a cable system which seemed to hold the roof of the stadium and these gave it a special look from the outside. It has an advantage over the other clubs by stadium architecture for sure, but I am no fan of this type of modern artificial type of building and would like to stick to a more ancient style even if outdated and not suited for a stadium. Even a Colosseum or any amphitheatre would have been further more satisfactory for me. I would have chosen something of the ancient Greek style surrounded by hills on most of the sides and steps carved into the sides; that would have been a fantastic scene and the best place to watch a soccer match from. That would be an instant when one would be close to the nature as well as to the sports; there would be even poems as a side-effect of watching these soccer matches and there would be some new English literary movement in relation to these Premier league matches; but that would be too far gone an idea. Manchester could not be all about sports even as it was all that filled the mind at that time. There was going to be something special, a Hidden Gem as they called it, St Mary’s Church, a Roman Catholic Church which has been serving the people of Manchester since 1794. It would be no match for the usual cathedrals of the United Kingdom in size, and all those structures would make this look unimportant due to it’s simplicity and small size. The importance of the structure is that I could find it between thousands of similar looking buildings. It’s doorway has a Medallion of the Lamb of God held by two beautiful angels from both sides. This door along with the small cross on the top and the small statue of Mother Mary might be the only thing which differentiates the church structure from the buildings surrounding it. As it was closed, we spent more time in front of the city town hall which looked like a cathedral at first sight. The Manchester Town Hall is a Victorian-era, Neo-gothic structure which attracts you even from a long distance away and it is as if it has the ability to attract tourists from a long distance away. A little distance from there, stood a statue of Abraham Lincoln which was kind of surprising for me. There came the American feeling out of nowhere. As much of Manchester’s history is concerned with textile manufacture during the Industrial Revolution, I could trace it’s stories back to what I saw in the medical museum in Leeds. As the most productive centre of cotton processing and the biggest marketplace for cotton goods, Manchester was the land of textiles, a Cottonopolis and a Warehouse City for the island. As one of the first industrialised cities of the world, Manchester is the symbol of modernisation and urbanisation even as it was not free from workers’ rebellions and riots. Affected by the Great Depression in the United Kingdom of the 1930s and the Second World War, Manchester has changed and now we know the city for sports and not industries. Now it has it’s two teams at the top of the English Premier League this year set apart only by the goal difference. But Manchester’s legacy will live on in it’s museums from it’s Roman history to it’s heavy role in the Industrial Revolution, from the textile industry to it’s Trade Union movement closely following the women’s suffrage and even football which is always growing in strength with a history of the past and the present. One can see the effect of the Industrial Revolution from the city’s Coat of arms itself; it is different as it has an antelope and a lion both wearing red roses and holding a shield; there is a globe covered by flying bees and also a ship along with a knight’s helmet. It is surely about industries, trade and navigation. Everything had to begin somewhere and for me it all began at Perumbavoor, until the second beginning at Alwaye. Kothamangalam was never a beginning though, as it always existed as the shadow of reality. It kept the roots, but a tree has to grow beyond the walled area, beyond the outer fence into the roads. This is where Perumbavoor comes into the scene, as the harbinger who brought the foreshadow effect of what Alwaye was to bring into the picture. But the world was old and the circumstances were different and therefore, what it brought was erased upto an extent by a newer Aluvaite effort for supremacy, with it’s superior and a much more developed world, with not only better roads, buildings and proximity to the city of Cochin, but also due to the inception of a new type of life based on a typical society which was needed for me at that time. The transformation from Perumbavoor to Aluva was a grand one, and the initial graph went up at a rate which could have brought eternal doubt into the minds of millions, but it all came back to that point of neutrality and not much had changed in essense, as it was figured out and the right point between the two, blessed by that shade of Kothamangalam was reached soon enough. Perumbavoor is located about thirty three kilometres from the city of Cochin and lies in the middle of Aluva, Angamali, Muvattupuzha and Kothamangalam, connectiong these four towns. The Main Central Road lies between Angamali and Muvattupuzha and the Aluva Munnar Road between Aluva and Kothamangalam, both passing through the centre of the town of Perumbavoor creating occasional traffic problems which are sometimes quite huge and bigger than one expect. The roads are not bigger, but it hasn’t really created much relief around. Perumbavoor has been an industrial town and it also had it’s own attractions in the form of Iringol Kavu and also various locations on the banks of the river Periyar somewhat away from the town centre. The town is also close enough to Kalady which leads the people to Malayattoor and Kanjoor while Kodanad and Paniyeli Poru are quite close, the first two religious and the last one a tourist destination of natural beauty. The town also has it’s share of temples, churches and mosques and most of the religious groups have some strong presence in the town and around it. Perumbavoor is not too far away from the airport either, as it is easily accessible by taking a left turn from Kalady. Perumbavoor also has many immigrants from other parts of India, especially North, most work in the plywood and other related industries around. This, along with the bigger roads and a few shops are what has brought some change into the town after I left the place about ten or eleven years ago. 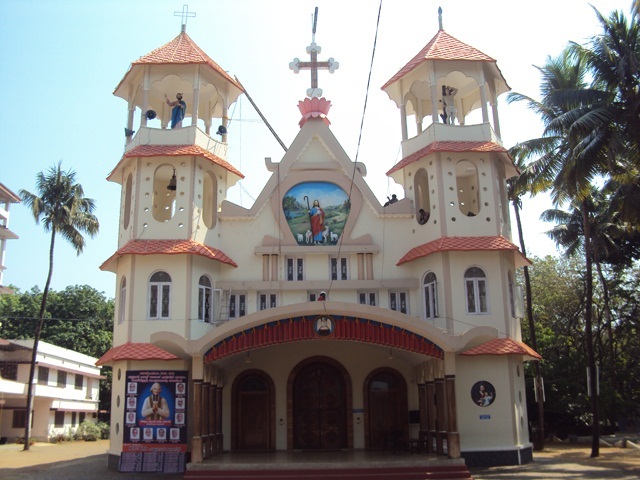 The famous religious centres of Vallam, Kuruppampady and Pulluvazhi remains almost the same and the use of town in the journey to Kothamangalam and Muvattupuzha has been less these days too, with the discovery of routes through Vallam and Valayanchirangara removing the possible problem of a traffic jam which is always possible considering the importance of the route and the way it passes through the centre of the town where there is almost no place for parking vehicles without creating trouble for the bigger four wheelers. The simplicity of the town which I saw as a kid has vanished, but that is still development, something which has to happen with a fly-over or a bypass which hasn’t really occured, but that was built in Aluva when there was no need at all, which is quite strange a thing. Perumbavoor used to be a place of so much peace away from the heavy urban areas. But just like any other area around, it also had to change in such a way that it would carry the torch of change to the other cities which lies beyond it, as we look from Cochin. Kothamangalam and Muvattupuzha will also change, and sooner or later they will be crowded in the same way. The good thing which has happened to the town in the last few years is the EVM Cinemas, which I would consider as one of the best theatres around, unlike the other theatres in the same town and the other muncipalities around. It deserves to serve as a centre of movie watching for people from even bigger towns. The town has also evolved with more places for food, but it has lost it’s Indian Coffee House which I visited for so many years; now the closest one is at Kalady, followed by Aluva with the newest of the branches. Most of the older restaurants hasn’t really survived either; the bakeries had mixed luck though. But there are some areas which look unaffected, they look exactly the same; not only the buildings, but the people who didn’t change at all, and that is a real good thing. The land where the tea drinking started, not as a practice or as a competition; but as something which had to happen; the place where the earliest of school days where spent; to be honest, most of the school days. Tea and school are in no way inter-related, especially at those earlier stages, as those were the days of sip-ups and ice creams which clearly had that advantage over tea. I had blessed two schools of the area with my presence even if I doubt if they will consider that much of a blessing, having a kid who was always so adamant and always thinking in that route which might be kind of different or strange. I spent nine long years in these two schools combined and was the perfect nerd who scored heavy in exams until I moved from this place. May be Perumbavoor had induced in my brain that power of study, that boon which it started taking away slowly as I moved further away from the place when I changed school and house. Those were good days with wonderful people and what followed me to my new place was tea, stronger than ever before. The new place gave me an effect of three though, with Shake, Biriyani and Tea, to be termed SBT in short and the two new addictions lived for about eight years before bowing down to tea as they slowly faded away. As the milk shakes looked at tea with reverence, the hot drink which I can claim to have consumed more than most of the people who are twice older than me, has kept those links with Perumbavoor as well as a few other places around, strongest being at this one town and Kothamangalam, linking on to Aluva. When we find those flashbacks and make movies like X-Men: Origins, this is where it goes back for me; I am no Wolverine and I am no mutant who is called into X-Men or looking for some job with someone who is referred to with a single English letter which becomes a Vin Diesel movie if two more of the same kind is added to it’s both sides. This one would track my origins, my past which is synchronous with my present and future, as it never really existed without each other; my past lives with me and so does my future; it is just that the first one changes the latter at times when I think, at those times when the present is just a spectator. I would live in the present, but I also think in the same tense which makes the past the most powerful of the three, followed by the future; the absence of future sometimes comes into the mind, but it is also a kind of future which will gain something from the past-inspired present which stretches it’s arms towards what comes after it, the future.